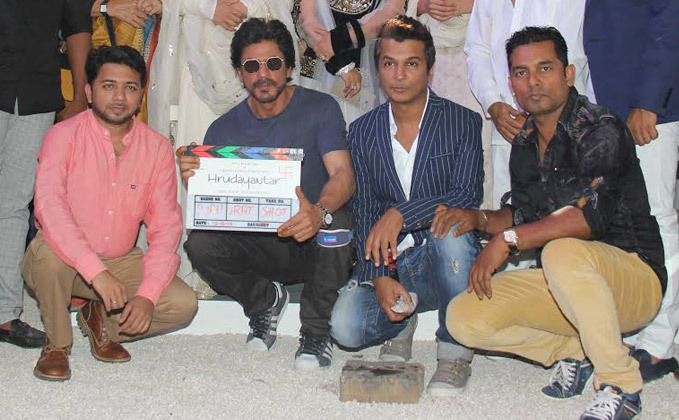 Superstar Shah Rukh Khan on Saturday came for the traditional mahurat clap of designer Vikram Phadnis’s directorial debut Marathi film “Hrudayantar” and wished its team good luck. “I wish the whole team good luck and I wish they make a beautiful film. Every film is like a first child. We all know Vikram is very hard-working and very sorted. We wish good luck to him and his team,” Shah Rukh said at the event where filmmakers Abbas Mustan, and actors Arjun Kapoor and Malaika Arora Khan were also present. “Hrudayantar” is a social drama that traces the journey of a family. Earlier, Vikram was to make his directorial debut with Hindi film “Nia” starring Bipasha Basu and Rana Daggubati, but it didn’t take off.